Identification: Menhinick (1991); Page and Burr (1991); Mettee et al. (1996). Native Range: Lower Coastal Plain from South Carolina to southern Louisiana (Rosen 1979; Page and Burr 1991). Table 1. States with nonindigenous occurrences, the earliest and latest observations in each state, and the tally and names of HUCs with observations†. Names and dates are hyperlinked to their relevant specimen records. The list of references for all nonindigenous occurrences of Heterandria formosa are found here. Ecology: Heterandria formosa is one of the smallest freshwater fish species in North America, with females maturing at 15 mm SL (Bennett and Conway 2010). Inhabits still waters of pools and slow-moving streams in areas of dense vegetation (Boschung and Mayden 2004). 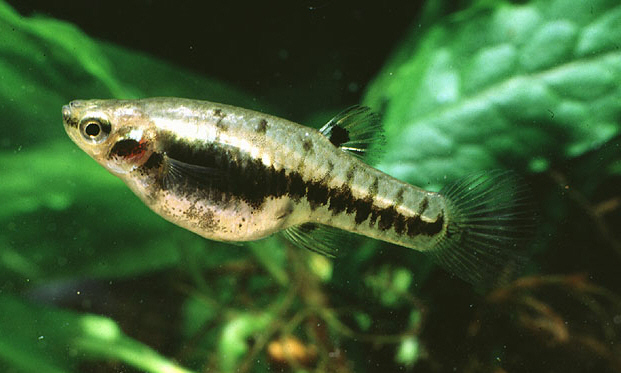 Dwarf killifish are omnivorous, generally consuming aquatic invertebrates (ostracods, copepods, and cladocerans) but will also consume plant materal as well (Boschung and Mayden 2004). Means of Introduction: In 1905 about 10,000 Heterandria and Gambusia were stocked into New Jersey for mosquito control purposes (Seal 1910). The reason for the North Carolina stocking is not known. Status: The New Jersey population apparently did not survive; the species is established in North Carolina. Remarks: Seal (1910) did not provide the locality or localities in New Jersey where he stocked fish, although he did mention that at least one of the sites was some 90 miles from Cape May. Krumholz (1948) indicated that the fish stocked in New Jersey came from North Carolina, but that information does not appear in Seal (1910). The isolated population near Wilmington, North Carolina, is similar to the distribution of Lucania goodei, another species listed by Menhinick (1991) as introduced. These similar distributions could indicate a shared transport event, or conversely, a shared refugium (Starnes, personal communication). Bennett, M.G., and K.W. Conway. 2010. An overviwe of North America's diminutive freshwater fish fauna. Ichthyological Exploration of Freshwaters. 21(1):63-72. Boschung, H.T., Jr. and R.L. Mayden. 2004. Fishes of Alabama. Smithsonian Books, Washington, D.C.
Krumholz, L. A. 1948. Reproduction in the western mosquito fish, Gambusia affinis affinis (Baird and Girard), and its use in mosquito control. Ecological Monographs 18:1-43. Seal, W. P. 1910. Fishes in their relation to the mosquito problem. Bulletin of the U.S. Bureau of Fisheries 28(1908):831-838.